Oblong softcover (8x10), 1991 (from Production Notes on last page). 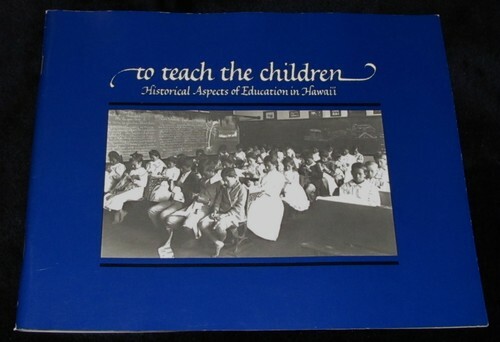 Originally printed in conjunction with TO TEACH THE CHILDREN: HISTORICAL ASPECTS OF EDUCATION IN HAWAII, a commemorative exhibition co-sponsored by the College of Education, University of Hawaii at Manoa and the Bernice Pauahi Bishop Museum September 1981-December 1982. 68 pages. Profusely illustrated. Introduction by Alexander Pickens, College of Education, University of Hawaii. "Governor John Waihe'e proclaimed October 15, 1990 as the 150th anniversary of the signing of enabling legislation by Kalani Kau'ikeaouli, King Kamehameha II, which established Hawaii's public school system...This historical piece provides an excellent context for understanding the past, present and future of education in Hawaii...."